The Weekend consisted of 7 games in total, of various point sizes, played over three days. 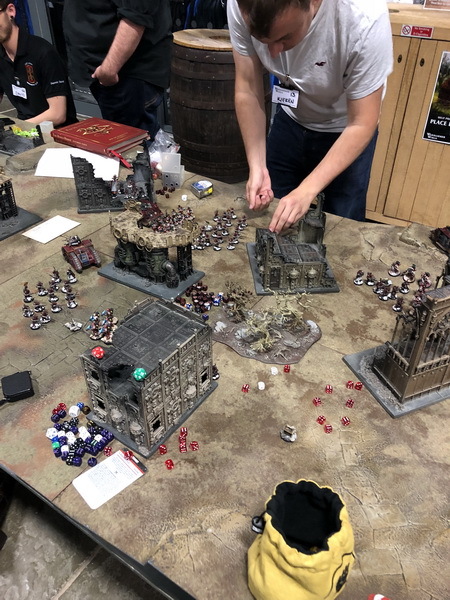 Being a “Narrative Campaign” each player took part as part of a team – either Loyalist or Traitor – with about 40 or so players per side.. As it turned out we were all playing Traitor Armies so we were all on the same side. 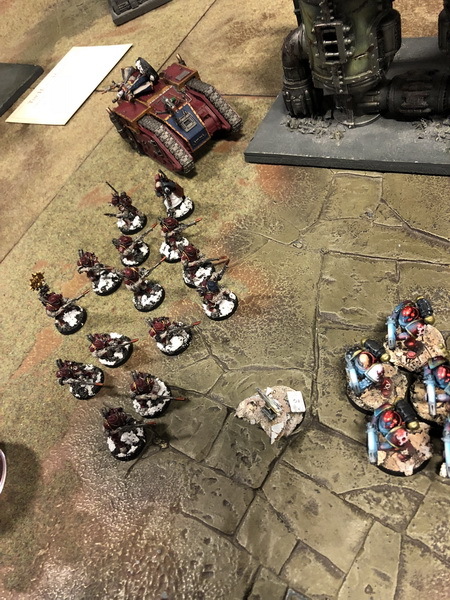 I took my new Word Bearer Force for their 1st outing under the Horus Heresy Rules, with some allied Daemons to make up my shortfall in points for the bigger games. 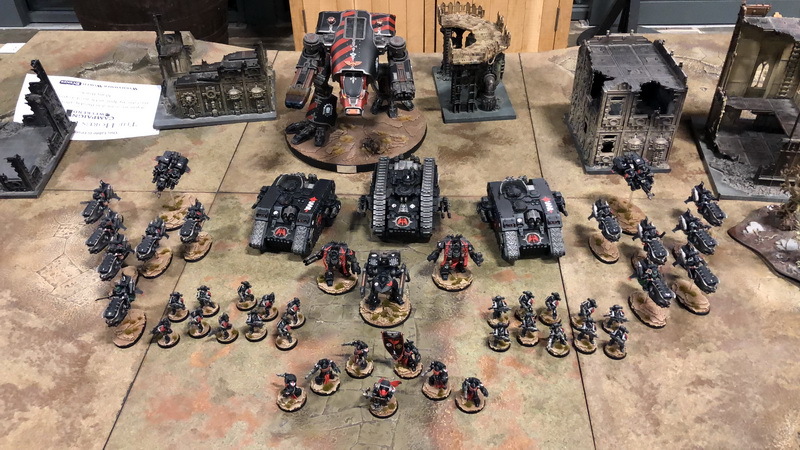 I’ve only played a couple of games Horus Heresy (effectively 7th Edition 40K rules) since 8th Edition 40K was released, so that, coupled with the fact that I was not using my usual Mechanicum army but an army I had never used with these rules meant I wasn’t exactly over brimming with confidence. The organisers had said from the off, that the 4000-point lists were “flexible”. The idea is that everyone should have a chance to use their “big toys” (and many did!). 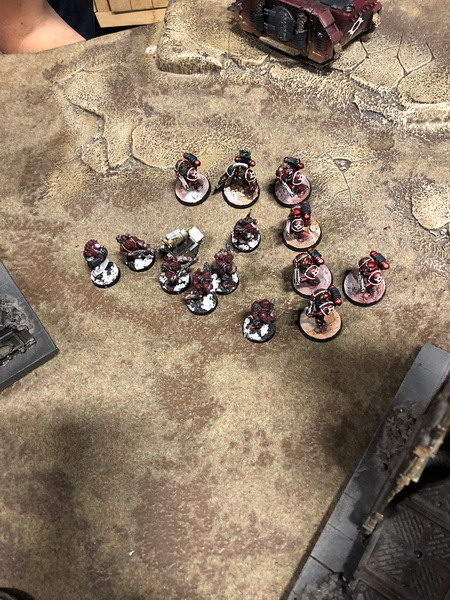 Players were encouraged to talk to their opponent before the game and could play as many or as few points as they wish – if they wanted to go more they could, and anyone with smaller armies could use special strategies to help balance the forces. The games were played in good spirits and many players took the opportunity to really go to town and use all their toys. 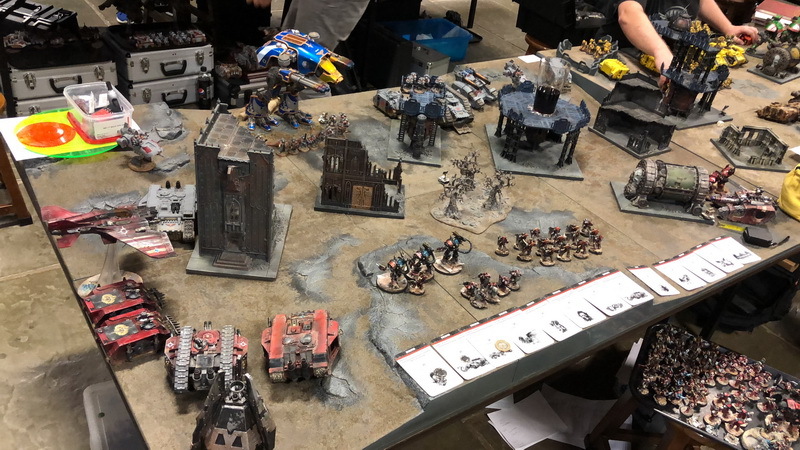 There were two Warlord Titans gracing the tables along with a couple of Reaver Titans, a Stormbird, a Thunderhawk, numerous Warhound Titans, and more Super heavy Vehicles than I could count. It was quite a sight! 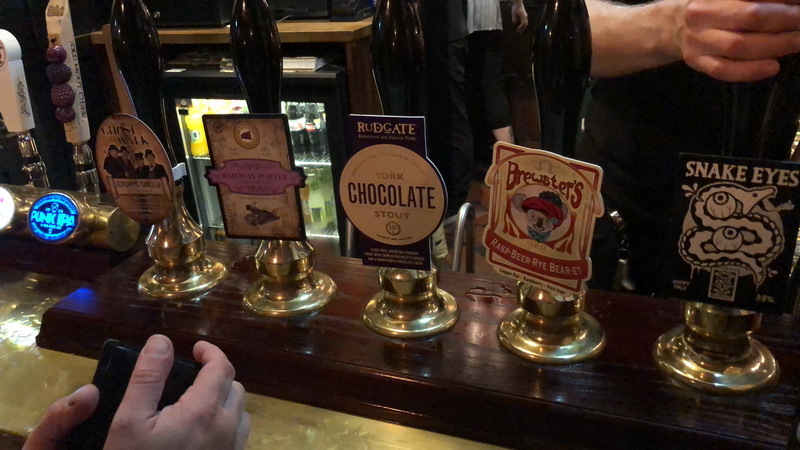 We had a couple of pints in the hotel Friday Night, but basically had a quiet evening and a relatively early night in preparation for a long day on Saturday! Everyone arrived early Saturday morning eager to get stuck into the fighting. Day two kicked off with a 2500-point game. I was drawn against the same player who had destroyed Alex on Friday, but the smaller sized game meant no Warhound Titan, for which I was grateful. My fledgeling Word Bearer force as yet has no super heavy support at all so I would have struggled if he had used it. 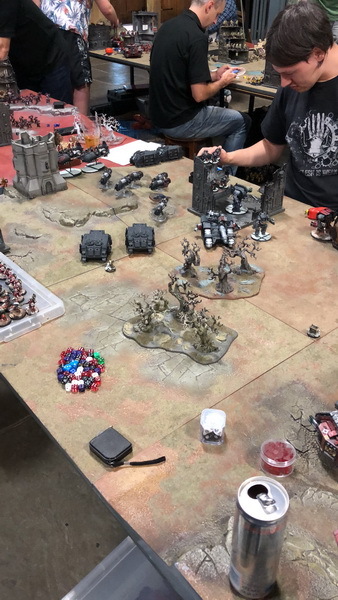 It was a fun game, and my opponent was very patient with my lack of knowledge of my army and my rustiness with the rules. But I was pretty much outclassed and lost quite heavily. Lawrence and Alex both fared much better and both won their games. After a short break, we dove straight into game three. This game was a 1000-point game using what they referred to as a “Scout Force”, so no vehicles with a total armour value of 34 or more and no named characters or Lords of War. We also had a bespoke scenario to play. 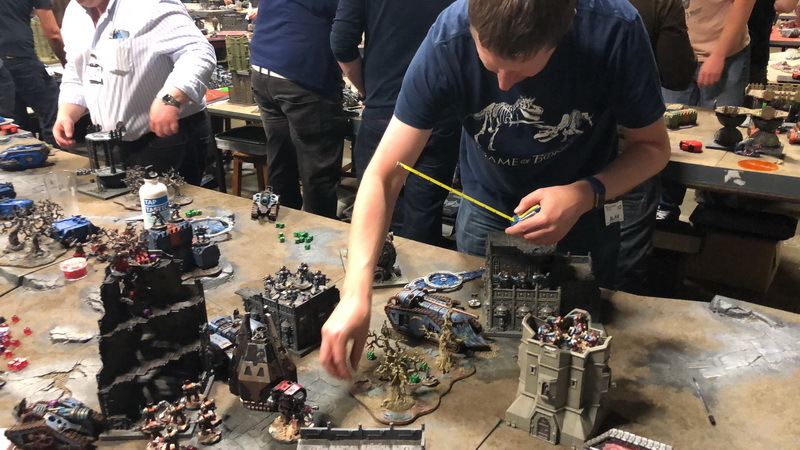 I really enjoyed this format of the game – the smaller points value gave a very different feel to the game from the normal 30K game with different tactics required. 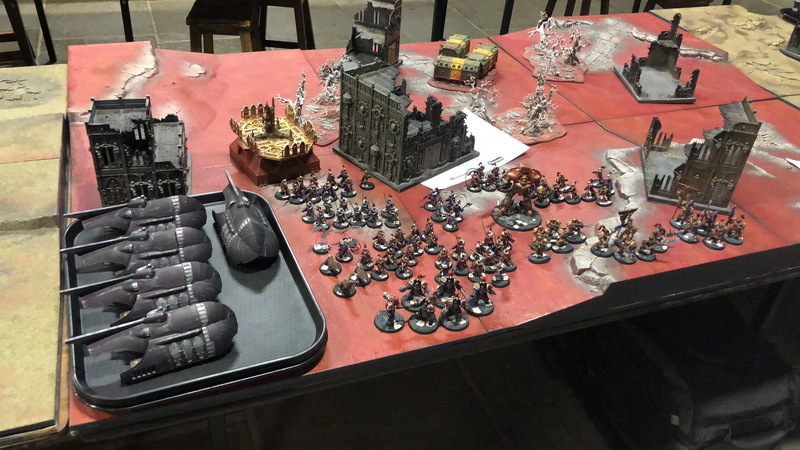 Also, it meant my Word Bearers were on a much more level playing field! 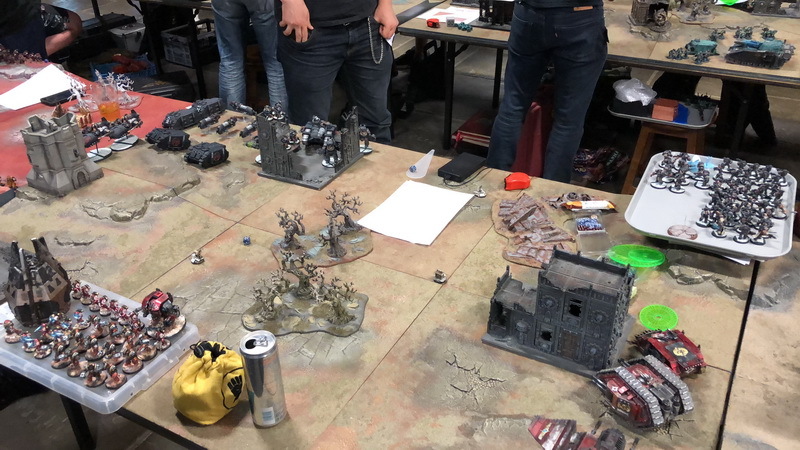 I was drawn against another Imperial Fist player so I was a bit more prepared as to what I was facing at least. I managed to do quite well in this round, grabbing the objectives early and keeping my opponent off them. A win for the Bearers of the Word! Lawrence and Alex also won their games so a great round for the Warlords! After lunch, we played another 1000-point game with the same “scout force”. We were allowed to adjustments and swaps to our lists depending on who or what we were facing, but I just kept with the same list, as I believe most players did. I was drawn against the same guy I played in my first game. We were able to swap opponents with the table next to us if we wanted to, but as the first game had been a great fun game we both decided that a rematch would be fine. That was a mistake on my part, as once again I was soundly beaten! Lawrence and Alex both won their games again, so it was just me letting the side down. 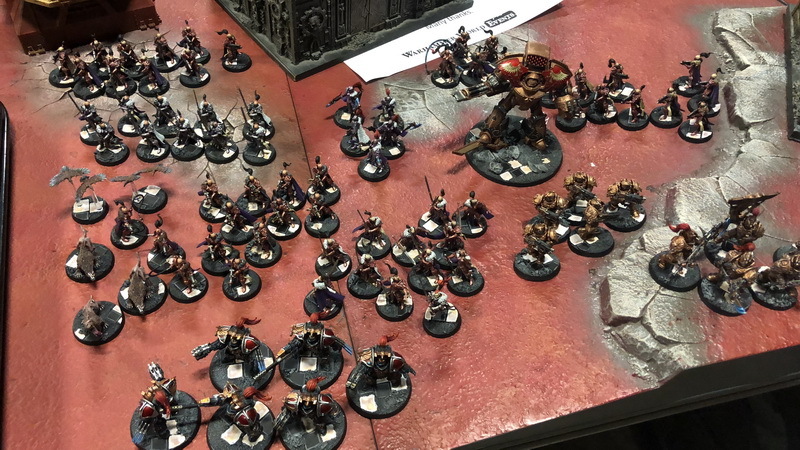 Another short break and then onto the last game on Saturday – another 2500-point game. 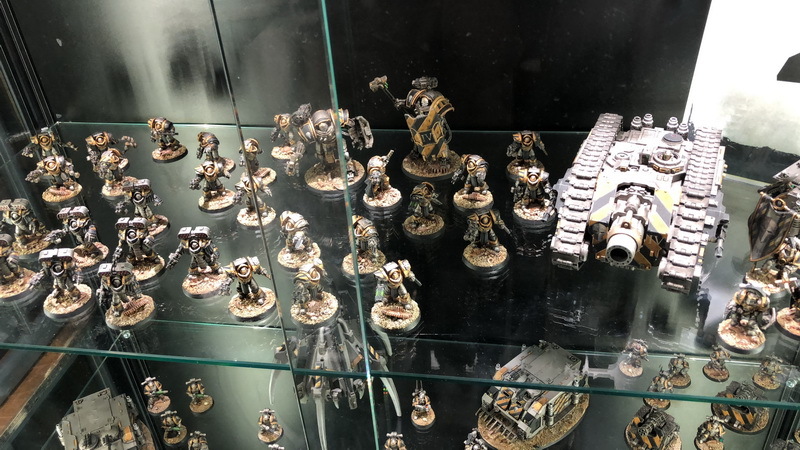 And low and behold – another Imperial Fist Army! I was beginning to wonder if I was going to play against nothing else! This time though, my opponent brought a completely deep striking army, very different from the others I had played so far. This game was a great game with loads of close combat from the off. 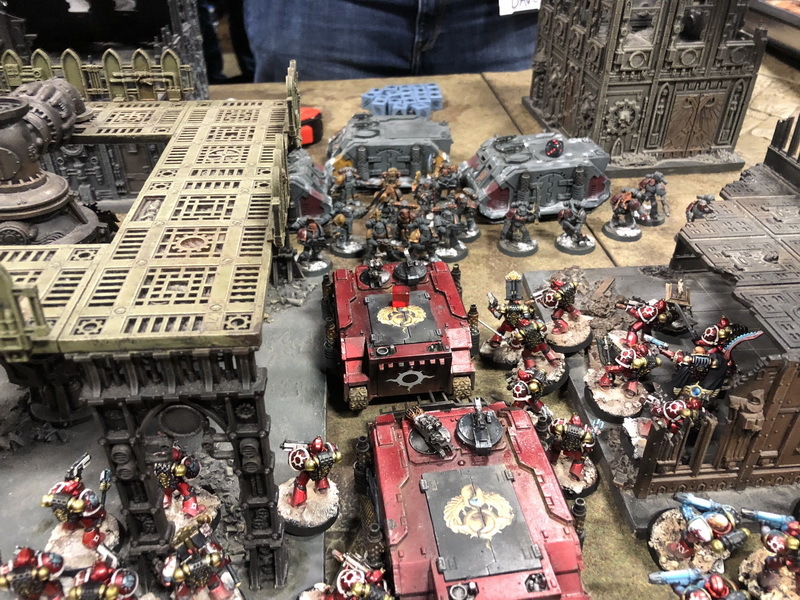 At the end of the game, there were three ongoing combats, with each having just one Imperial Fist figure surrounded by overwhelming numbers of Word Bearers. 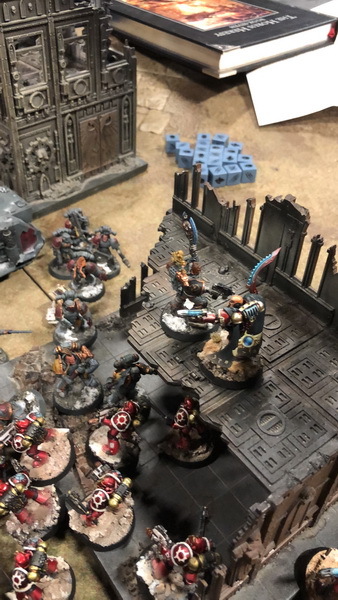 In the end, it came down to a rather beaten up tactical squad vs a lone terminator. 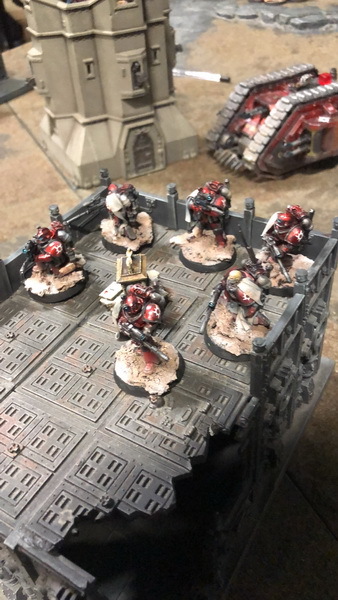 If my tactical squad could kill him in my opponents turn and if they could then run far enough in my turn, they could grab the last objective and steal the game. The terminator fought a brave fight but succumbed to a final blow from the tactical squad Sergeant. Then the Tactical squad made a last desperate dash to the objective. They made it with 1 inch to spare! Victory! This was a really fun, tense, and close game (the type we all love to play) against a really nice guy. 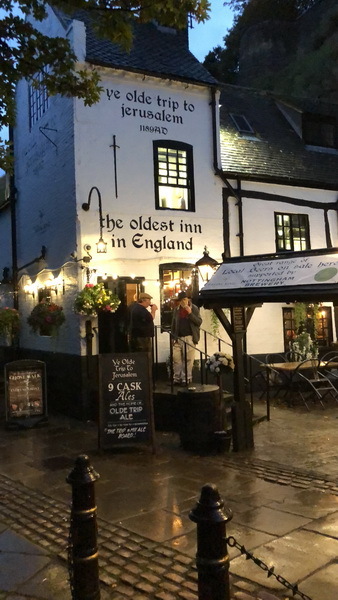 In the evening Lawrence and I hit the town to celebrate our success – well Lawrence’s success anyway! 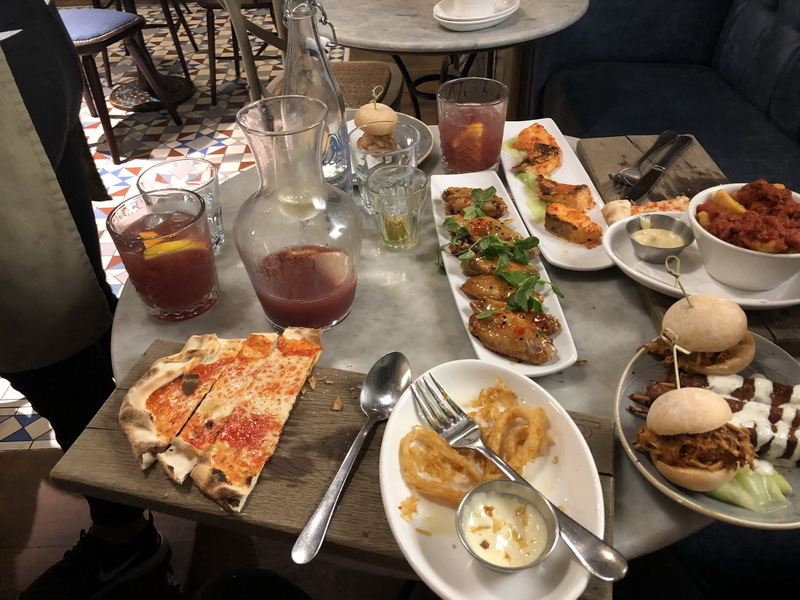 Tapas and more than a few Sangrias later we headed back. We arrived not very bright-eyed and not very bushy tailed for Day 3. The first game on Sunday was the 3rd and Final “Scout Force” game. 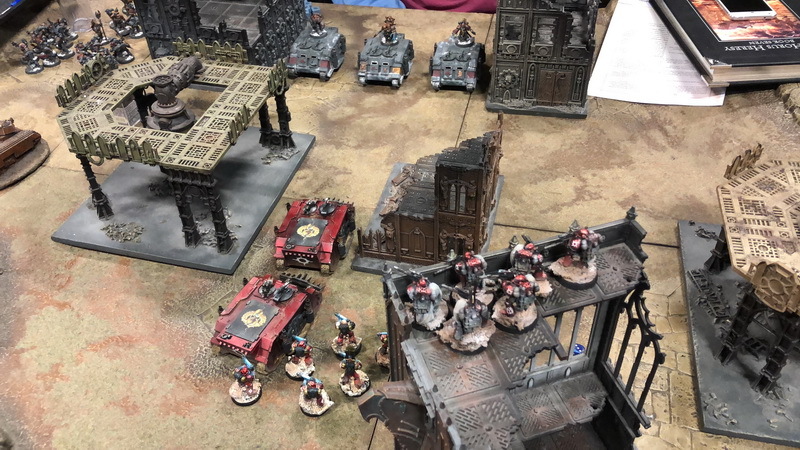 This time I was drawn against a White Scar army! Much as I had enjoyed the games against the Imperial Fists, this was a welcome change. 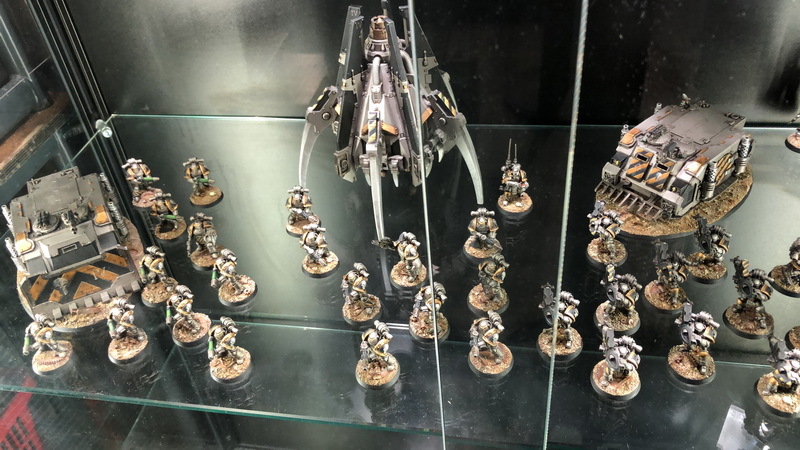 My opponent’s army was a gorgeous army entirely made up of Jet Bikes, so very different again to the previous lists I had faced. The mission being played was to capture an objective in the middle of the board then try and move it off the board. 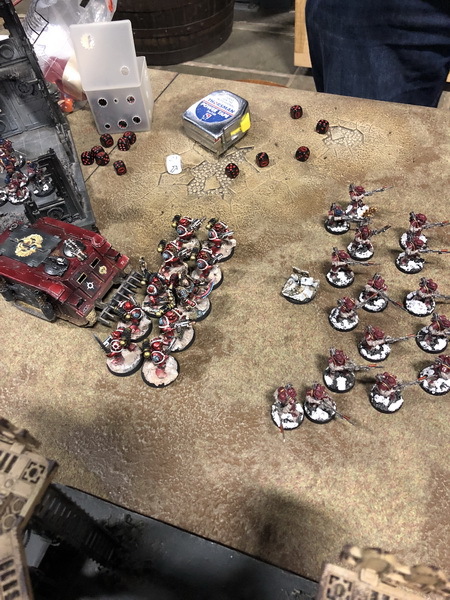 Predictably the White Scar army was way too fast for my mostly foot-based Word Bearers and while I did make a good account of myself, killing a fair few jet bikes, I was soundly beaten. During the break for lunch were the various painting competitions. They were running competitions for “Best Character Figure”, “Best Squad” and “Best Monster/Vehicle” They also did a “Best Scout Force” comprised of the models in our 1000-point lists. All the figures entered were to be from the armies that players were using on the day. They were also an award for “Best Army” on the day. The standard of painting on display was really quite amazing, especially as all the figures entered were the players’ gaming figures. The final game of the event was another 4000 “flexible” point game. So out came the Big Toys again. The Two Warlord Titans faced off against each other in a grudge match. I didn’t see who won in the end, but it was a something to see both on the same table! 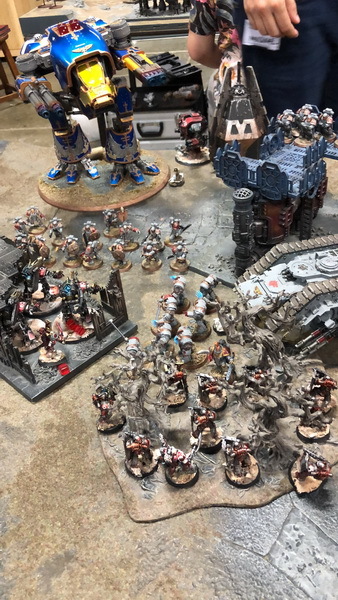 My last game was against an Iron Hands army with the Primarch Ferrus Manus leading the charge with 20 Gorgon Immortals in tow. This was a hilarious game with so many crazy things happening. My opponent was a great guy. He actually knew my army better than I did and was super patient and helpful with rules and stats. 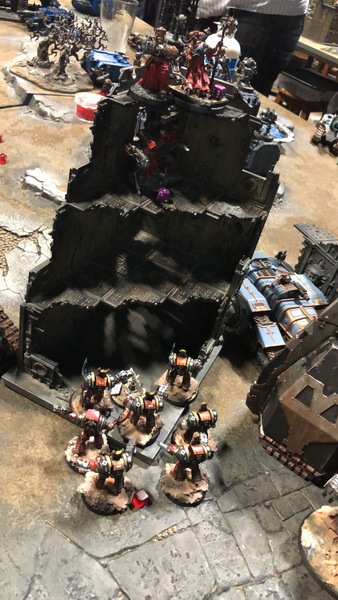 Despite getting off to a great start buy killing a Landraider and most of its occupants with my first shot of the game, once Ferrus and his pals disembarked from his Spartan the game was never in doubt – another loss for the Word Bearers and their Daemon Allies. 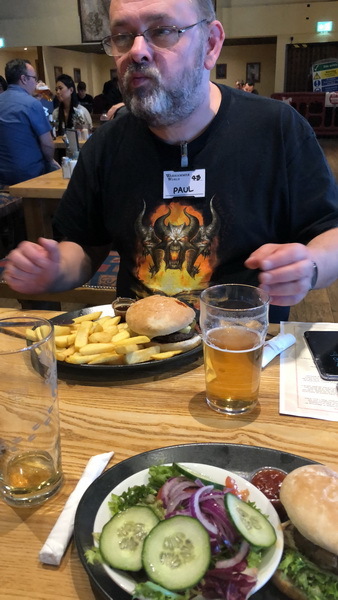 Lawrence, predictably won again, this time taking out a Warhound Titan in the process, but sadly Alex lost a very close game (by a single Victory Point) to a Custodes Army. The only things left were the results of the painting competition and to discover which side had won the campaign. The Traitor side had been on the back foot pretty much the whole weekend and despite a good final round, the Loyalists emerged victorious! The whole event was great fun if a little exhausting. Seven games in 2 and a half days is a LOT of dice rolling. Added to that, a problem requiring the hall to shut early on Saturday meant it was quite rushed getting four games in. Sunday, however, was much more relaxed having just the two games (all be it one was a big game!) The “narrative campaign” format, with everyone split into two teams, meant an individual’s results were of less importance and only the teams’ overall results affected the course of events. This led to a much friendlier and less cut-throat approach than a more standard tournament format. 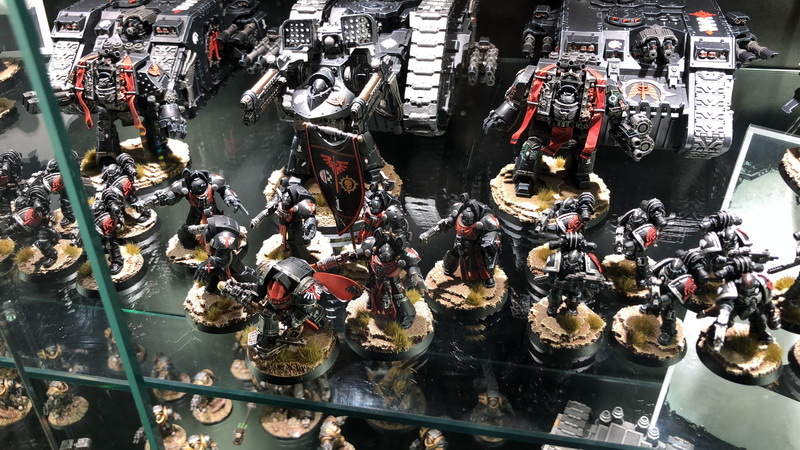 Also, the standard of painting and modelling on display was much higher than the normal “three colour minimum” of an average 40K tournament. Overall it was a fantastic event and I’m looking forward to attending other similar events in the future.